A new campaign called ‘More than a Cold’ has been launched to help parents and health professionals to understand the symptoms of bronchiolitis. The campaign follows the publication of updated NICE guidelines earlier this year that encouraged parents to become familiar with the symptoms, and that as bronchiolitis is caused by a viral infection, antibiotics should not be used as treatment. The More Than a Cold campaign provides practical advice and materials for parents and healthcare professionals about managing bronchiolitis and how to reduce the risks. The campaign was developed and funded by the biopharmaceutical company AbbVie, and is supported by 7 charities; Bliss, the British Lung Foundation, the National Childbirth Trust and the Twins and Multiple Births Association, Tiny Tickers, Tiny Lives and WellChild. Materials include an infographic, leaflet and a poster, which have been developed to raise awareness of the condition, encouraging parents to take action to prevent the spread of the virus and recognise bronchiolitis symptoms. Bronchiolitis is a viral lung infection affecting babies and young children, and is more common during the winter months. The lower airways in the lungs become infected and inflamed so the amount of air entering the lungs is reduced, making it more difficult to breathe. 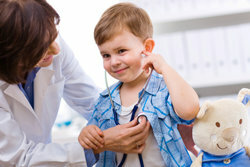 Symptoms, although they can be distressing for parents to witness, are usually mild and may only last for a few days. Helping parents and carers understand this can increase their confidence in caring for their child at home. However, in some cases the disease can cause severe illness: bronchiolitis is the most common cause of hospital admissions in babies with up to 3% of infants admitted to hospital with the condition. Babies are at greater risk of developing severe bronchiolitis if they were born prematurely (born at less than 37 weeks), are under 12 weeks old, were born with a heart or lung condition, or have another immunodeficiency condition. In some cases, babies with a high risk of developing severe bronchiolitis may be offered an immunisation by a paediatrician or neonatologist.